Note 6/20/17: The linker now works with the X4R-SB or the D4R-II receivers. You will need to update that radio with the Linker to OpenTX 2.2 when using an X4R-SB. Earlier firmware had a bug that would not allow Sbus data to work correctly. If you are using older firmware you will want to use a D4R-II in the linker. We find that is is best to use the D4R-II with the linker due to telemetry errors when used with the X4R-SB. Just annoying messages..
We saw a need for a wireless trainer feature for the FrSky transmitters. We could have made up a messy one with cables hanging out of the back of the radio, but we knew there was a better way. We worked closely the OpenTX developers to bring about a better option. The linker is fully contained inside the module bay. No loose wires, simple and clean. The design is pretty simple. You simply plug in a D4R-II or X4R-SB receiver and set some jumpers on the board. The second radio can be anything that can link to the receiver installed in the linker module. Here is the great thing about the Frsky transmitters, thanks to the power of OpenTX, they have one of the most powerful trainer features. This can be used for training, but it can also be used for many other applications. When using an X4R-SB receiver, you can pass control of up to 16 channels via the Linker. No other radio system can do that. When might you use this? This can be used for passing off camera controls, advanced items for large scale projects, etc. You can actually sub link out to additional FrSky transmitters when they are all equipped with a Linker. Imagine a battleship where each gunner can have control of his own turret with his own radio. 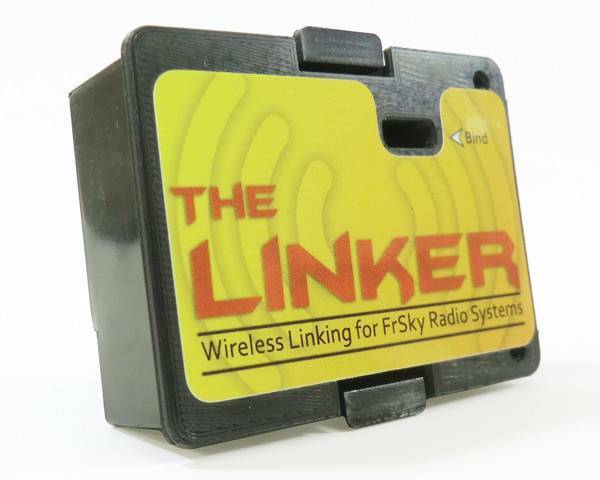 The Linker provides a wireless link between two radios, a “Master” radio and a “Remote” radio. The Master radio is the radio that would be under control of the instructor if used in a training session. It should be a Taranis, Taranis Plus or Taranis E (X9E) and will have the Linker module installed in the module bay. The “Remote” radio is the radio that would be used by a trainee in a training session or as the secondary radio for auxiliary control. When used in a training session the Master/Instructor radio will initially be in control of the model. Control will pass to the Remote/Trainee radio when a switch is activated on the Master radio. Typically the Taranis spring-return switch “SH” on the far right will be used so the switch must be held on when you want to give the Remote radio control, releasing the switch will give control back to the Master radio. When the Remote radio is used for auxiliary control functions, channels to be controlled by the Remote can be assigned permanently to the Remote radio. An example would be to have the Remote radio assigned to control the camera gimbal on a Multirotor platform. 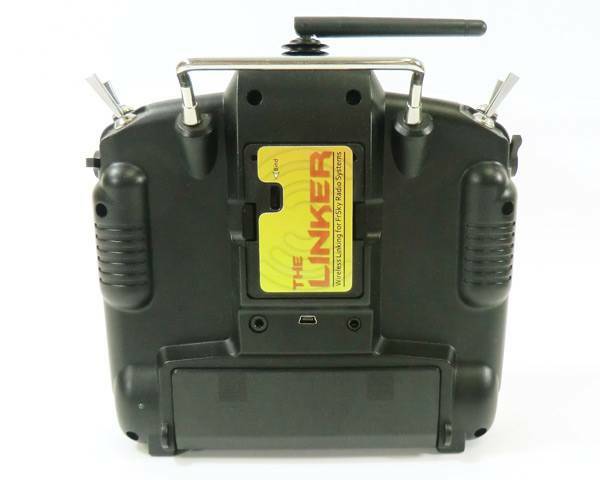 The Linker Module can be used with Taranis Batteries up to 16 Volts. The Master radio must be running OpenTx Version 2.1 or higher, 2.2 when using an X4R receiver. 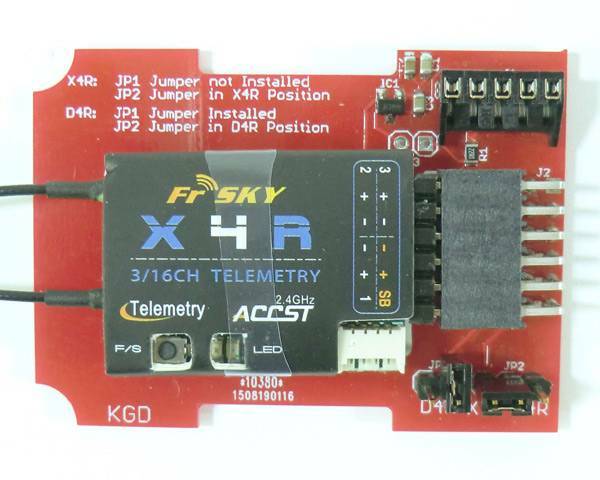 A D4R-II or X4R receiver must be installed inside the Linker module if the Remote radio is equipped with a DJT or DFT module. 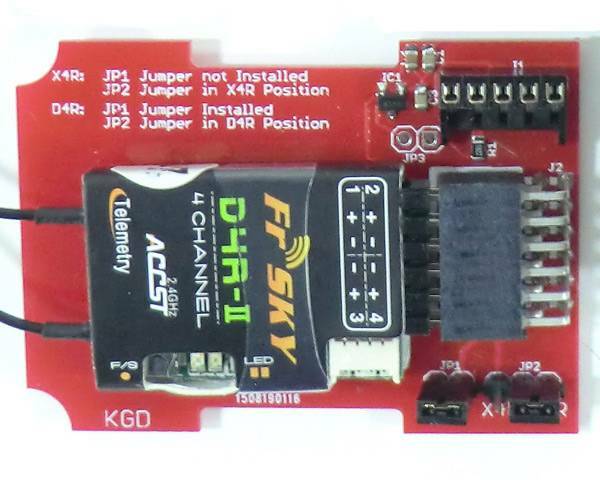 For Taranis or XJT module equipped Remote radios either an X4R-SB or D4R-II receiver can be used in the Linker. In the Master RADIO SETUP, Page to the TRAINER Screen. In each of the 4 lines Ail, Ele, Rud, Thr: change Mode to “:=” and set the percentage to 100%. Set the Source Channel Number to match the channel number to receive from the Remote radio. Select the Model to use in the Master radio. Page to the MODEL SETUP Screen. Set “Trainer Port Mode” to Master/SBUS Module. Select the Model to use in the Master radio. Page to the MODEL SETUP Screen. Set “Trainer Port Mode” to Master/CPPM Module. 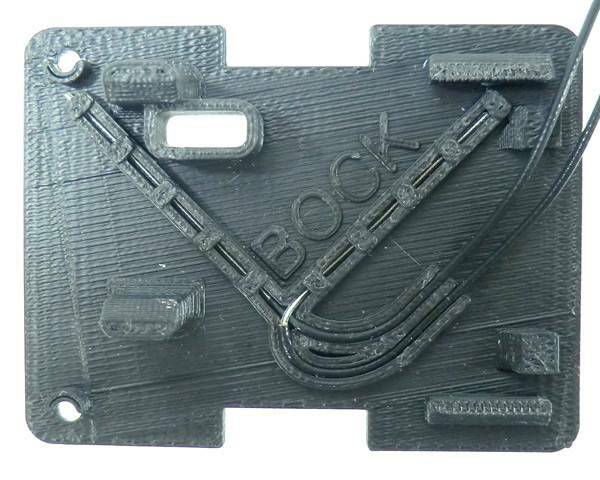 Don't forget to route your antennas into the pockets on the module cover. In the SPECIAL FUNCTIONS Screen add the line above. When SH is Activated (Moved Toward the Operator) the Remote radio will control the model. When SH is Released the Master radio will control the model. To set up channels to be permanently controlled by the Remote radio simply change the switch allocation to the setting “ON”. If a D4R-II receiver is installed in the Linker Module set internal RF mode to D8. If an X4R-SB receiver is installed in the Linker Module set internal RF mode to D16. If using a Taranis as the Remote radio, in the Remote radio MODEL SETUP screen, select [Bind]. 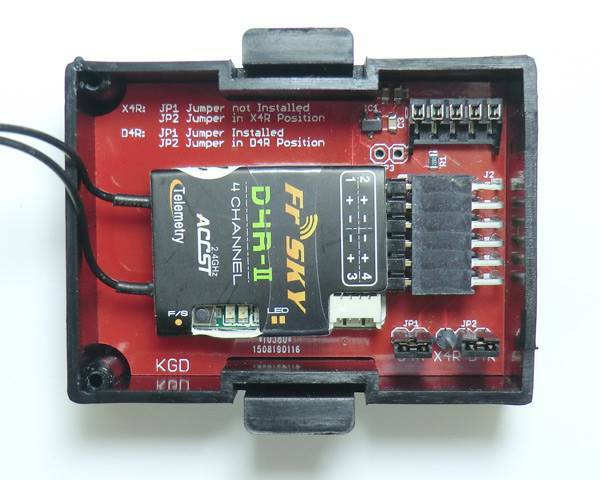 For Remote radios using a Frsky Module push the bind button. The transmitter should begin to beep or chirp. Hold down the bind button in the Linker Module with a long pointed object and turn on the Master radio. Wait until the Master radio initializes and the receiver LED’s turn on. Release the Linker receiver bind button. The receiver is now bound to the Remote radio. Our friend Fig Newton on RC Groups was nice enough to point out a really neat option with OpenTX that allows the teacher to regain control of the aircraft simply by moving his sticks, no fumbling for the trainer switch! He has written a blog and included EEPE files for the Taranis radios. Check this link for more details: Click Here. I will warn you that he has some pretty advanced programming going on here, but well worth checking out! The above is a partial listing. Basically any radio that can link to the X4R or D4R-II receiver that is inside the linker will work. This includes radios that can work with a DJT, DFT or DHT FrSky module. In most cases, any radio with a trainer port can be adapted to work with the exception of some of the newer Spektrum radios as they lack a normal CPPM signal.